What size opening do you need for bifold doors? Bifold doors are a versatile external door solution, available in a range of sizes and configurations. If you’re looking to fit them in your home, the size of the opening you’ll require will depend on a number of variables, which have been covered in this post. 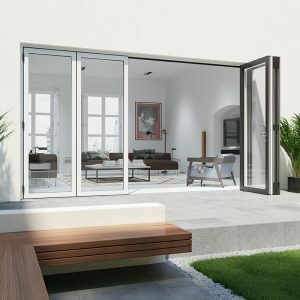 What size are bifold doors? Learning about how big or small bifold doors are is useful for determining what size bifold door do I need. The size of bi-folding doors will vary depending on the manufacturer, although they tend to be between 6.8 and 7 feet in height. Their width will depend on how many door panels you’d like to use, although most configurations are designed to fit openings of around 1.8m and wider. Individual door panels tend to be between 500 and 1000mm. So if your chosen door panels are 700mm in width, you’ll need at least 3 of them to fill an aperture wider than 1.8m. It’s worth noting that panels can also be custom made if the size you’re after isn’t available, however this is likely to incur a cost. 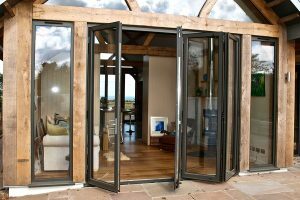 What is the minimum size for bifold doors? The minimum width for bifold doors is 1400mm. In order to fill this opening size, two individual 700mm wide door panels would be used. It is unwise to build them any smaller than this as they will bind when closing. The tracking hardware: If using a flush track, for example, the height of it will be the underside of the sunken track. For a flush track, this tends to be around 45mm below the floor level on which the door will be installed. The fitting tolerance: Generally, the width and height of bi-fold doors are manufactured to account for the structural opening size minus the fitting tolerance which is usually between 10 and 15mm. It’s worth taking into account the space limitations in your home too, so you don’t end up with a set that is either too big or small. Bifold doors from Associated Windows are constructed from aluminium of the utmost quality. The epitome of contemporary style, they’re available in a range of configurations and sizes to suit any aperture. Interested in a set for your home? Get in touch today on 0117 9311777 or send us an online message.